It’s the month of May when we especially honor Our Lady. 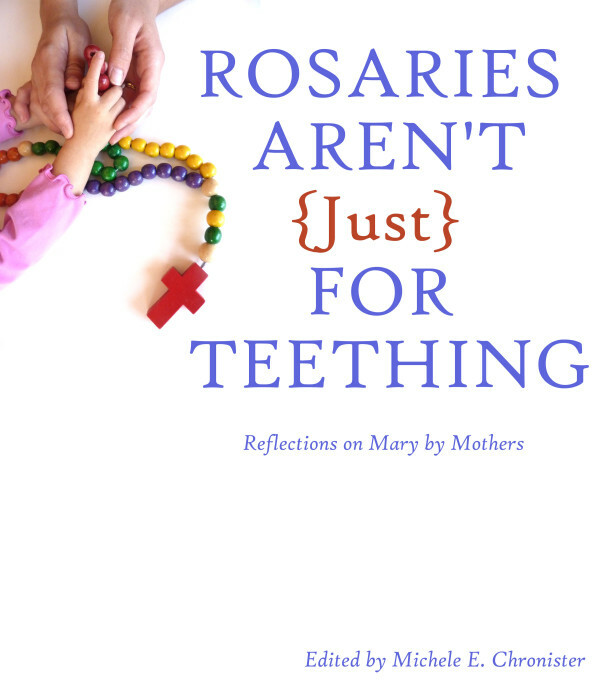 And lucky for you, the beautiful book I got to contribute a chapter to, Rosaries Aren’t (Just) for Teething, is being released and I have THREE ecopies to giveaway! So enter with the rafflecopter, it’s open until Wedneday night at midnight, EST. All ya gotta do is leave a comment and the winners will get a PDF of the book in their inbox on Mother’s Day! 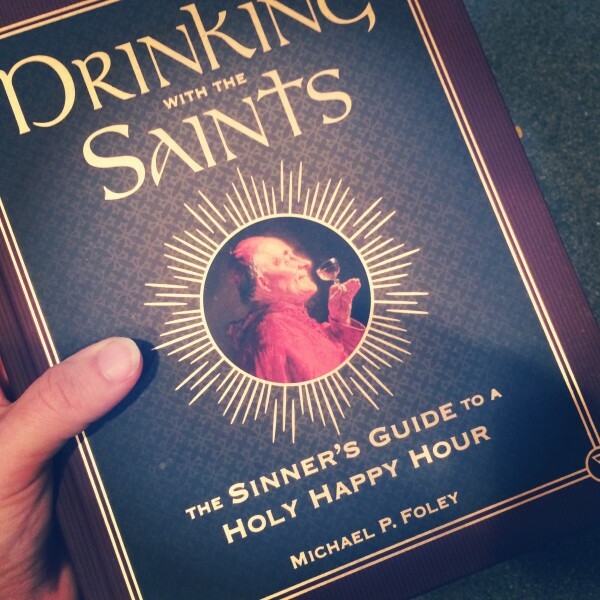 And while we’re on the topic of books you should know about, it’s also the release date today of Drinking with the Saints: The Sinner’s Guide to a Holy Happy Hour by one of my favorite college professors, Dr. Michael P. Foley. It is simply gorgeous! If I didn’t already own it, I’d buy it for Daniel for Father’s Day. So check it out! 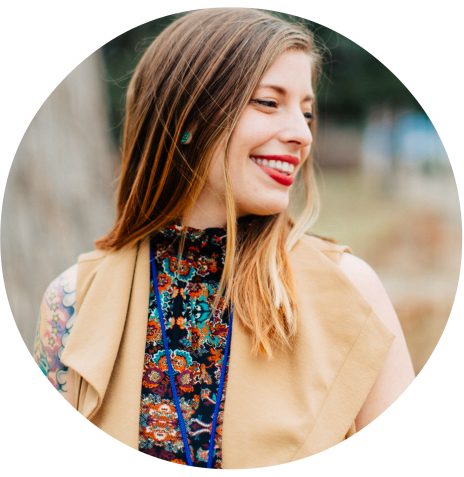 And in other news, my dear friend Bonnie is on the radio now with awesome co-hosts Rebecca Frech (we had a fun interview on the podcast with her recently) and Heather Renshaw! 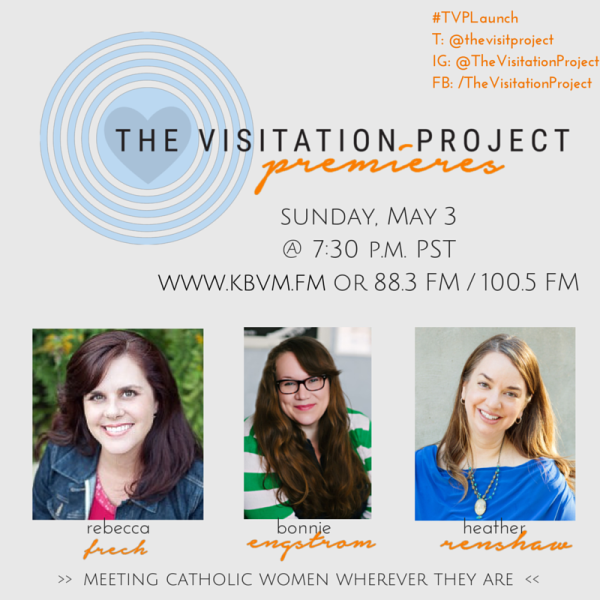 Want to know more about The Visitation Project? WHEN: Sundays at 7:30 p.m. PST on Catholic Broadcasting Northwest (KBVM). HOW: Listen live via the Tune in radio app or online. Shows will be archived on KBVM’s new website for download and later listening. 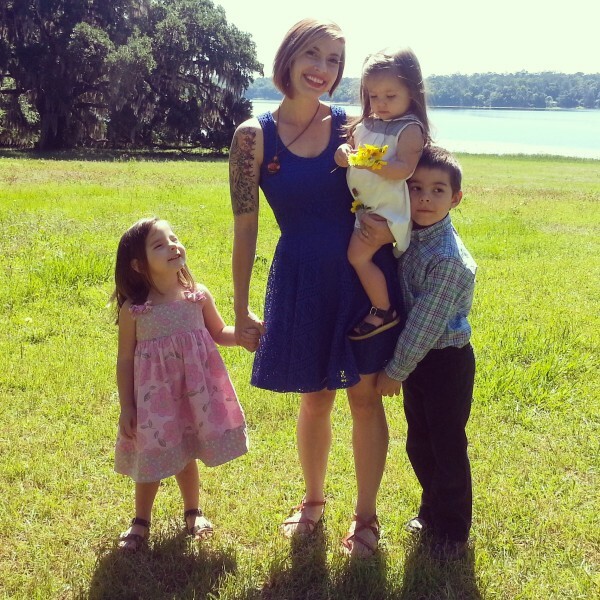 WHY: Catholic women should be able to chat about real life challenges while living faithfully and joyfully! Have a great week, friends! Wishing you weather as beautiful as we’re having (minus the mosquitos)! I like the joyful mysterious best because, as a mother of young children, I like thinking about Jesus’s relationship to his mother during his infancy and boyhood. The Transfiguration always makes me think of a conversation with a friend in college after a Sunday night Mass. Years later, I still pray for her at that mystery each week. Hmm. I think maybe the luminous are my fav? Prob between that and sorrowful. Not that sorrowful are my favorite, idk I feel like that’s a bit macabre but they do get me thinking. The Institution of the Eucharist is my favorite. A good reminder to be thankful for the Eucharist. The luminous mysteries are my favorite. i love the sorrowful mysteries, I feel like it’s the most powerful meditation for me! I don’t have a favorite mystery; I’m sure it’s because I don’t say the Rosary often enough. I’d love to win a copy of the book. We’re trying to get in the habit of saying a rosary on Sundays, so a book to inspire would be lovely. I am so interested in hearing the visitation radio show. I have put a book buying hold on myself until I get through more of my current stack, buuut winning isn’t buying, right?!? Lots of my favorite bloggers in this, would love a copy! Hmmm… I’m not sure I have a favorite. But, I like the joyful mysteries. The sorrowful mysteries are my favorite, especially during Lent! I’m a Protestant who, for several somewhat complex reasons, is learning to pray the Rosary. I have JUST started getting through a whole Rosary on more days than not. I’m interested in anything to help me learn about how it works, how to meditate on the mysteries. I definitely don’t have a favorite yet, although trying to do the Sorrowful Mysteries every day in Lent was hard. I think I might like the Luminous ones best, because right now I like the reminder of the earthly parts Jesus’ life. Oh, and the last 2 Glorious mysteries still feel very foreign to me. So far, only have the Joyful Mysteries memorized, but I love meditating on the sorrowful aspects of each one and how even (perhaps even especially) in the hardest times through the past year, I find in each difficulty a kinship to Our Lady. Since my baby Alice entered the world on 4/27/15, I think my favorite mysteries are the joyful ones. My heart has been full of so much joy the past week, and the mystery of the nativity has so much more significance since my husband and I welcomed our first baby! The Joyful Mysteries…and we are working on saying the rosary more as a family, so I love the idea of this book. I am not sure which is my favorite. I am currently in the process of learning everything I can so i can join our RCIA class in the fall. The rosary is like therapy for me. I choose whatever mystery relates most to what is going on for me. I have a special devotion to St. John Paul II, so the Luminous Mysteries are my favorites. The Visitation is my favorite mystery of the Rosary. This book looks awesome; it has so many of my favorite bloggers! I love the Annunciation. Bright and powerful. I’d have to say one of the Joyful mysteries… hard to choose 😉 Definitely going to check out that Drinking with the Saints book! It is hard to choose but I agree, the joyful! Really looking forward to this book! The Annunciation…it is awesome to contemplate Mary saying yes! The joyful mysteries are my favorite. I am a convert (raised Baptist) and I love reflecting on Jesus’s infancy and childhood through the eyes of his mother. But I also really like the sorrowful mysteries because they make me uncomfortable. I think that’s good. It’s one of the many reasons I like being Catholic–sometimes it makes me sweat a little. I like the glorious mysterious. I never think I can dwell on the glory of the gospel too much. That is great to hear about. Good books are truly treasured. And the weather in Southern California great. No Mosquitos, but no water either… can’t have everything. Oh 🙂 so my favorite one is The Descent of the Holy Ghost (The Glorious Mysteries) – each time I pray with this one I just feel joyful and full of hope for upcoming days. We would love to get in the habit of saying the Rosary with our little ones. 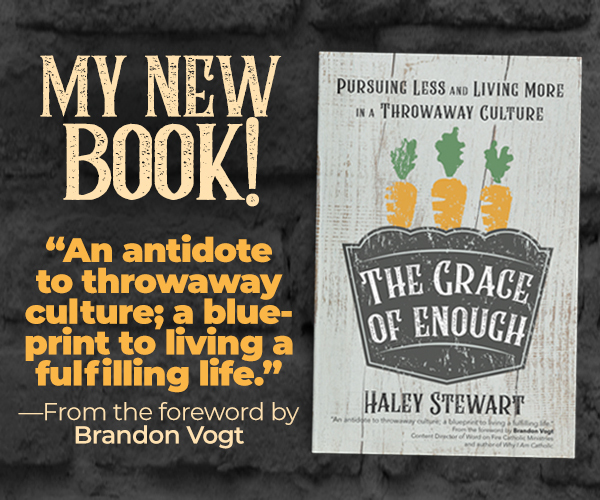 My hope is that this book would inspire us to do just that! I always liked the Joyful Mysteries as a child, and I think they’re still my favourite – especially the Anunciation , because it’s the very beginning of everything, and the Visitation, because it somehow seems such a “normal” thing to do – go visiting! When I need a really encouraging prayer experience, I go for the Joyful Mysteries everytime! How can you resist them?? There’s just so darn JOYFUL! My favorites are the Annunciation, Visitation, and Nativity. All of these just have such vivid imagery for me. I especially love thinking of Mary visiting Elizabeth and how Elizabeth’s baby leaped in the womb knowing the presence of Mary and the baby Jesus. I’m a new Catholic (I was baptized at Easter Vigil this year!) and have been starting to pray part of the Rosary with my three-year-old before bed. Lately I’ve been feeling strongly led to pray the full Rosary daily, so this book would be perfect! The Glorious mysteries are my favorite. I like the Joyful Mysteries best. All of them. I love the Annunciation. Makes me think about when I found out about being pregnant with each of my children and the beautiful collaboration with the Holy Spirit to create new life. I like praying the sorrowful mysteries the best. Hi, Haley – for your readers’ laundry folding, dish-washing, floor-sweeping, walk-taking, babies napping listening pleasure – The Visitation Project​ Episode ONE is now on the Mater Dei website: http://materdeiradio.com/the-visitation-project-episode-1-may-3-2015/ Thanks so much for your support! I love all of the Joyful Mysteries, and I can’t wait to read the book! I love the Coronation of Mary as Queen of Heaven and Earth! The Joyful mysteries have always been my favorite… And now that I’m pregnant with our first child (and due near-ish to Christmas) I feel as if I kind of get to travel those mysteries with our Blessed Mother! I love the joyful mysteries…especially the visitation. Can’t wait to read this!! I think the Annunciation is my favorite. A gimme, I know, but it will never not blow my mind. My first thought is The Nativity! So excited about your book! I love the Annunciation. I sometimes wonder what ordinary task Mary was doing when the angel visited her. Makes me think about whether I am always ready to respond as she did. I really like the Joyful Mysteries. My favorite mystery of the rosary would probably be the Annunciation. I find it beautiful to meditate on this particular moment in Mary’s life when everything changed! The joyful mysteries have always been my favorite.. From Mary agreeing to have a baby from God to Jesus being born. I’d love to win a copy to give as a gift to my Sister…. It all depends on what is going on… When things are tough, the Sorrowful Mysteries help me to feel comfort. Apparently like most people I would have to say the joyful mysteries. I think the nativity is one of my favourites. Its such an amazing moment in time and a wonderful way to connect with Mary through the experience of becoming a mother. Joyful! Very excited to read this book. I do not know much about the roasery personally but I would love to win this book!! Y’all’s podcast about it was wonderful, keep up the great work! The Luminous Mysteries because they are so uplifting and new! As a convert to the faith 3 years ago, we never learned the rosary through RCIA. I think this book is the perfect opportunity for me to gain this understanding and grow closer to Mary.